January 17th, 2019 –Today at the Lamacchia Realty 2019 Kickoff Event in Needham, Anthony Lamacchia announced that Angela Harkins was the top Realtor in the company with the most sales company-wide in 2018. 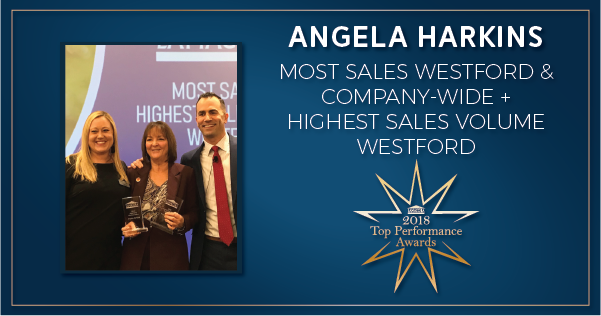 In addition to the most sales, Angela also won the most Sales and the Highest Sales Volume in the company’s Westford office. She had 49 transactions closed and over 17 million in sales volume. “The key to my success is to treat my clients and referral partners like family and do my best by them. Also, key is to affiliate with a company, like Lamacchia Realty, who supports my business with leadership, back office systems, and the best training from a brokerage that I’ve ever experienced or heard of in the business,” stated Angela Harkins, Realtor. Angela is a repeat member of the Company’s Presidents Club having won in both 2017 and again in 2018. Angela is regularly in the company’s Top 5 agents for the month and was also for the year of 2018. Angela has been with the company since 2015 when she joined forces with Anthony to grow her business and became a big part of growing the Lamacchia brand in the Westford and southern New Hampshire markets. Since joining the company, Angela has more than doubled her business and actually grew it 125% in her first year of joining. During her real estate career, she has consistently been a Top Producer and received many accolades & awards from the Realtor organization both at the state and local level such as; Realtor of the Year, Distinguished Service Award, Educator of the Year, and served as President of the Northeast Association of Realtors. Click here to get in contact with or just to get to know Angela better or visit her bio page and website here or to find her on Facebook click here.